Keep track of how much space you have in your Office 365 email account so you don't hit your quota, resulting in your not being able to send email. Note: If you have Starter email or Email Essentials, your quota is 5 GB. If you have Online Essentials or Business Premium, your quota is 50 GB. 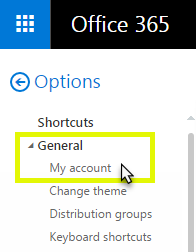 In Outlook on the web, in the upper right corner of the page, click the gear button. In the Settings panel, under Your app settings, click Mail. In the left pane, under Shortcuts, click General to expand the list, and then click My account. 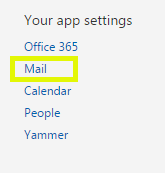 In the My account panel, under Mailbox usage, the amount of space you've used is listed.